Thank you for your interest in the Volunteer Program sponsored by the Parks, Recreation and Historic Sites Division of the Department of Natural Resources (DNR). The beauty of this state, and the diversity of its cultural and natural resources has, over the years, attracted visitors in untold millions to the state’s parks and historic sites to learn, to stretch, to relax, to explore, to appreciate—and to find themselves by losing themselves in a world of grandeur and wonder. Through this Volunteer Program we expect to be able to extend these benefits to many more Georgians and their guests, and to enrich their visits with more and better services and facilities. The Volunteer Program is a fun and educational opportunity for you to get involved. By enriching the lives of others, you enrich your own. It will be an experience you will remember for years to come. A task somewhere is waiting to be done; a child somewhere is waiting to learn; a trail somewhere is waiting to be built. Georgia’s parks and historic sites offer varied opportunities for volunteers to enrich their lives while enriching the lives of others. We hope this is a program that you cannot resist. Come to a state park in Georgia, chances are, the first people you see in the campground are our hosts. 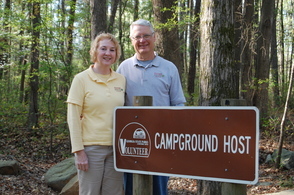 The campground host program is one of our most popular volunteer opportunities. In exchange for a free campsite and utilities for your RV or motorhome, hosts serve the park and the public. Hosts commit to a minimum of 2 months and up to a maximum of 6 months. Hosts contribute a minimum of 24 hours per week per couple. The Campground Host program utilizes volunteers who can furnish their own lodging (camper, RV, or motor home). Individuals, couples, or even families may serve as Hosts. Retired couples often find it an ideal way to spend a few months. If you have been asked to perform community service for school/university or other credit. Please apply using the community volunteer registration and indicate this is for credit with your school. Calendar of Volunteer Projects: see what projects are already planned and need help near you. Access to your account and volunteer profile: want to apply to volunteer or host throughout the state, here is where your account and profile is located to keep it updated on your availability and interests. Log your volunteer hours online: this helps us show the tremendous level of support volunteers provide to Georgia State Parks. Latest editions of the Volunteer eNews: We publish the eNewsletter the first week of the month. See the latest releases here. Volunteer Program Manual and Guidelines: Our dynamic program manual that helps describe volunteer responsibilities and changing policies. Friends of Georgia State Parks: The Friends of Georgia State Parks is the nonprofit organization that was created to help give back and fill a valuable need in our park system. If you have one park that you love, it is a great idea to become more involved in the Friends group for that Park. Georgia Conservancy: The Georgia Conservancy hosts stewardship trips in many of our state parks throughout the year. American Hiking Society: We partner with the American Hiking Society to offer Volunteer Vacations around the state. 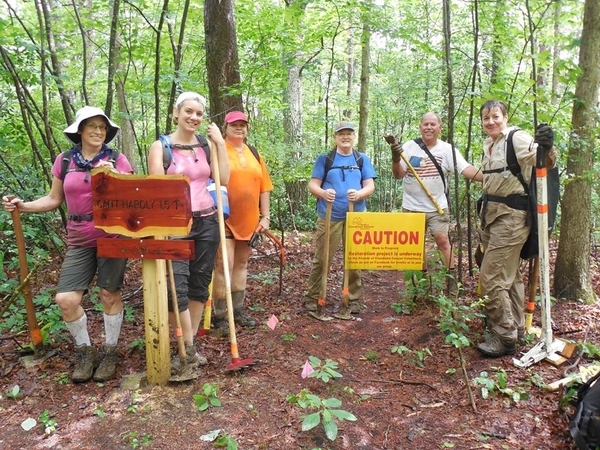 Each year hiking enthusiasts from across the US travel to Georgia to help build and maintain trails. AmeriCorps NCCC: Much like the CCC of the New Deal Era, the AmeriCorps NCCC have skilled teams that are granted to select parks for an opportunity to work on a large scale project for 3 weeks. Georgia Tech Trail Blazers: throughout the school year, the Trail Blazers find a park and project to aid. BreakAway: Universities from all over the US reach out to for alternative school break opportunities to explore a new area, volunteer at our parks, and at times experience camping, hiking and paddling for the first time. Chattahoochee River Keepers: Annually we partner with CRK to host Sweep The Hooch in 5 of our parks and historic sites that are on the Chattahoochee River or have tributaries that feed it. This massive event usually equates to 700-800 volunteers cleaning up tons of garbage from our beloved Chattahoochee River. Wildlife Resources Division: our sister division in Georgia DNR, we work closely with them in offering clean up projects and stewardship opportunities throughout the state. 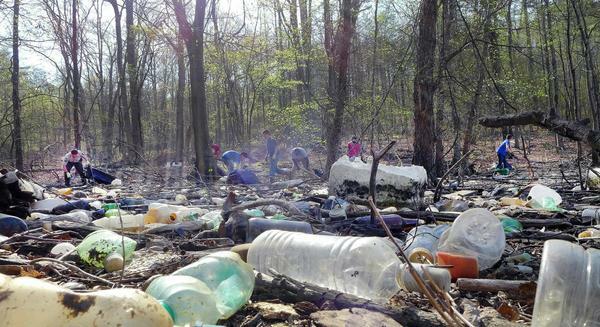 Rivers Alive: Many of our state parks and historic sites host river and shore cleanups on a regular basis partnering with Rivers Alive.